Onboarding can present challenges, especially when a new team member isn’t quite as familiar with a brand’s existing voice and tone. At Sprout, when a new social media specialist is given permission to publish content onto Sprout’s social channels, it’s crucial that they use language that matches our style. That’s why Message Approval is an integral part of the onboarding process for all members of our social team. At first, social team members are given Needs Approval permissions that allow them to draft and submit social posts for review but prevent them from actually publishing live. This lets them get comfortable with our content, style and approach to talking with our community. Once submitted for review, myself or our VP of Marketing approves or rejects the message. If the content is approved it moves directly into the existing queue and is scheduled for distribution. If a post is rejected, we’re able to provide a comment from within the Sprout platform and the team member can than revise the post accordingly and resubmit. 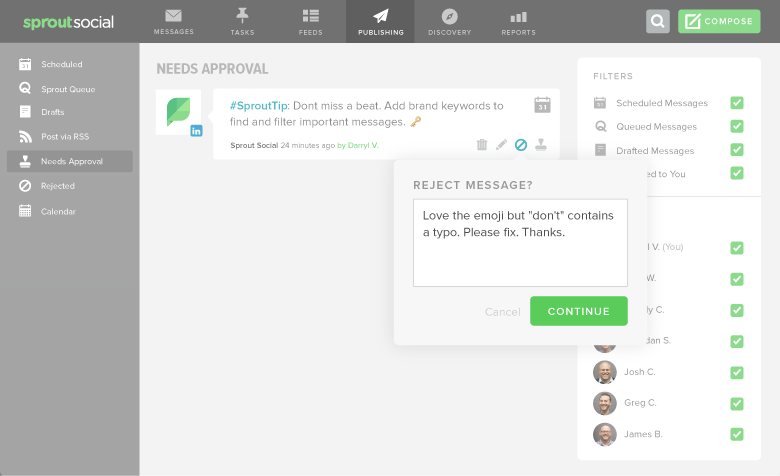 The Message Approval workflow is also available within Sprout’s mobile app. Like so many social teams who are always on the go, this is particularly beneficial for remote employees and for approving real-time content from networking and industry events. Having a message approval system is integral to an efficient social media management strategy; with our Message Approval workflow, Sprout aims to make that process smooth and easy so brands can distribute the best possible content in a streamlined way.